The Linkert Model DC is a side-float, tube-type carburetor, found primarily on 1950s and 1960s Harley-Davidson Sportsters and Servi-cars. The simple design has a venturi, discharge nozzle, adjustable high and low speed nozzles, and a fixed jet. The two moving parts are the float assembly and the throttle shaft and disc. 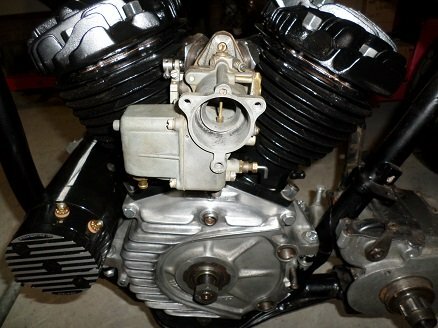 All 1957-1965 Harley Sportsters came from the factory with a Linkert DC carb. 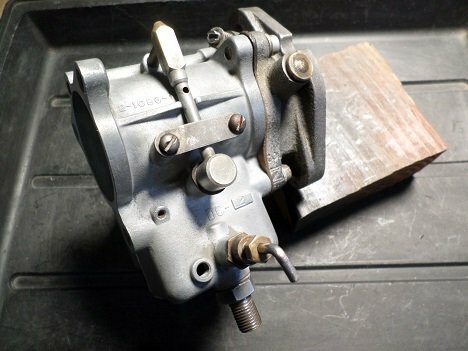 They were replaced by the Tillotson carb (diaphragm carb) in 1966, and then replaced by the Bendix carb in 1969/1970. The Linkert DC found on the 1959-1965 Harley Servi-car 45 flathead was "left-handed", that is, the float was on the opposite side of the ones put on Sportsters and Big-twins. The reason for this is Harley flatheads have the carburetor on the left side of the engine. With the exception of the Harley Shovelhead carb and the DC-2 on the Servi-car, all Linkert DC versions have the same carb body. Their venturi size is the same. They are not removable, they are a one-piece casting. The difference was changing the jet size, and modifying the inlet valve. Any change denotes a different model stamping. 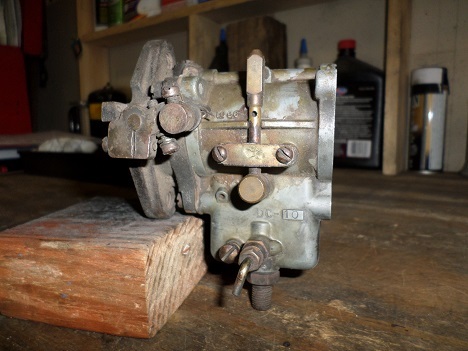 A gasket set and some carburetor cleaner is all you need to rebuild a Linkert DC carb. No special tools are required. A basic gasket set sells for $15 or so, and includes the bowl and body gaskets, seals, and an o-ring for the bowl vent tube instead of a gasket. All DC carbs use the same gaskets and seals. If needed, a larger gasket set is available, and includes the gaskets and seals, plus an assortment of small springs and screws (about $40). Removal and disassembly is straightforward. The carb is held to the manifold with two bolts. After completely disassembling, clean all parts. Blow out all fuel circuits and air passages with compressed air. Clean all passages, but do not enlarge them. Check throttle shaft for play. If play is excessive, the throttle shaft bushings can be knocked out and pressed in, then reamed with a 0.250" drill. 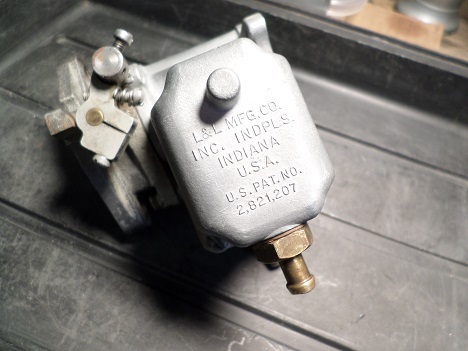 If needed, an aftermarket needle and seat for all Linkert DC carbs are available. The throttle-body is held on with three bolts and lock washers. After removing the four bolts and lock washers from the float bowl, remove it by tapping it gently. Inside the bowl you will see the idle tube and bowl nut. 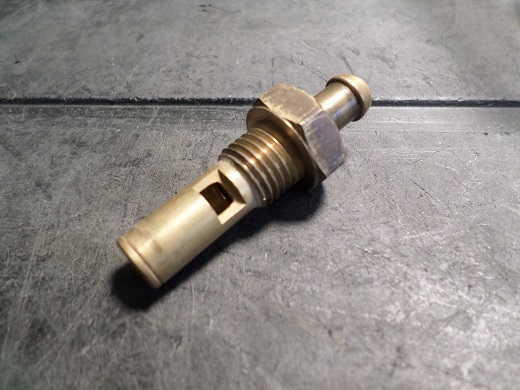 The float seat/main nozzle for the DC2 carb is different than other DC models. After spraying down into the fuel wells enough to make it puddle, let it sit overnight. Consider investing in a gallon can of Berryman's Chem-Dip (about $25) and soak the body and float bowl (not the float). This will dissolve the old dried-up remnants of fuel and removes sludge. 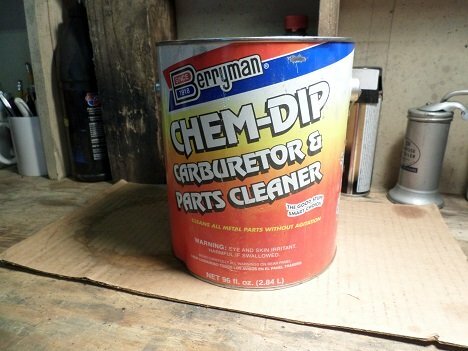 Be careful with this stuff - not only will it remove gunk, it will eat plastics, puff up gaskets, and remove paint. 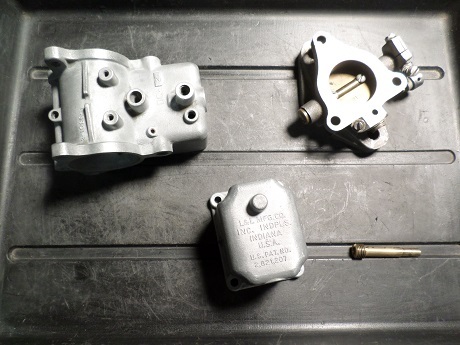 After soaking, rinse the carburetor parts with water and blow dry. A little brushing from a nylon brush will help clean up nice. When done, clear all passages with compressed air. The first stage in the assembly process is to install the throttle shaft and butterfly. 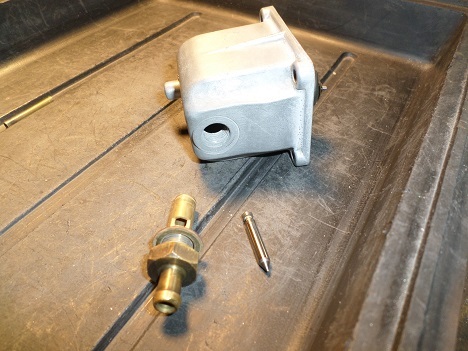 Next, assemble the vent housing assembly, gasket, idle bleed tube, and the two-screw clamp to the the main body. Screw the main nozzle back into the carb body, making sure the needle valve doesn't get jammed up in the seat hole. Re-install the metering plug. A #4 main jet is pretty standard in most DC Linkert models. According to the Harley shop manual, the DC-7 ran a #45 jet, which was the largest size. The DC-6, 10, and 12 ran a #4 jet (smaller). The DC-1 ran a #9. This is done with the float bowl removed from the body. Invert the bowl and measure the distance from the top of the float rod to the outer edge of the bowl flange (the one opposite the fuel inlet fitting). The distance should be one inch (give or take 1/64"). Use a new gasket on the float bowl. A homemade one is not advisable since the thickness of the gasket is part of the float measurement. Float bowl gaskets are the same on all 1957 through 1966 Linkert DC carbs. Install the throttle body on the main body with the three bolts and lock washers. Check for any throttle shaft interference. Re-mount the carb with bracket back on engine. Sportster XL and XLH models usually had one insulating spacer between the carburetor and the intake manifold. 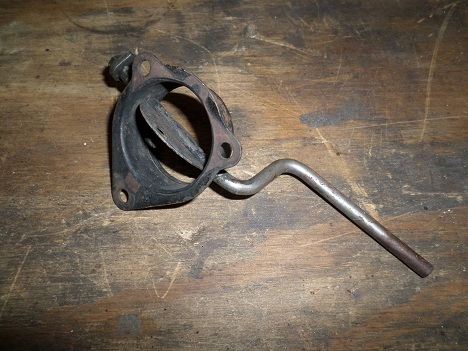 The Shovelhead Linkert required two spacers, and an XLCH Sportster may have three. Their function was to keep some of the engine heat from transferring to the carbs. Check to make sure the two mounting bolts are the correct length for the spacer/spacers. If they are too long, damage to the throttle body may result when tightened. The DC Linkert carb has an external choke plate in the stock air cleaner. Without the air cleaner, you have no choke. The Linkert DC carb is not a first choice for added performance, but for the competition-minded, there are bowl extensions that can be added to enlarge fuel capacity. It's an extra section that bolts in between the float bowl and the carb body. Some models have dual gas ports which give a better fuel flow. 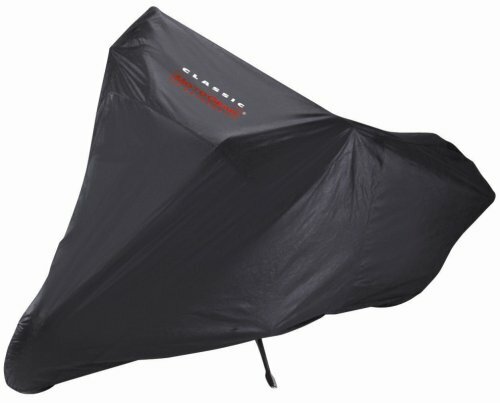 If you store your bike over the winter, untreated fuel may go bad in as little as six months. Longer than that, a fuel system cleaning is recommended.